Tensions have emerged in BJP's alliance with Bodo outfits. Can they hold together until Assam polls? What has the BJP proposed? What are the main points of contention? Among all the poll-bound states, it is in Assam where the BJP is poised to shore up its presence. This state, said to be the gateway to the Northeast, is also strategically important for the Sangh Parivar. The ruling Congress party in the state, under the stewardship of 79-year-old Tarun Gogoi, is battling anti-incumbency after being in government for the last 15 years. However, there are fears in the BJP that it certain moves of the Central government may alienate some of their new supporters in Assam. Some of the BJP allies also point out that they have not kept the promises which they made for the state in the 2014 Lok Sabha election manifesto. Promode Bodo, the young president of the All Bodo Students Union, an influential Bodo outfit says, "We supported the BJP in 2014 elections. That is why they won 7 seats. But they didn't do anything for us." The students leader points out how Bodo groups created a congenial atmosphere and stopped all ongoing movements. "Everyone is frustrated now," he points out. Bodo Territorial Administrative Council, which comprises of some of the most volatile areas in lower Assam has seen gruesome violence in recent years. The Bodos are engaged in a violent conflict with the Bengali speaking Muslims and also tribals from other parts of the country who have settled in Assam. The latter are referred to as tea tribes, because of their history of working on tea gardens. The Bodos, have been demanding a separate state. The Bodos are also angry on the Central government's notification on allowing long term permits to persecuted minority communities so that they can stay in the country. There is a fear that this will lead to their getting citizenship rights in the long run. Their is big population of Bengali speaking Hindus who have migrated to Assam fearing persecution in Bangladesh. On the other hand, the BJP has been vociferously opposing the presence of Bengali speaking Muslims whom they refer to as illegal immigrants. Tribals and other indigenous groups have been saying that the state doesn't have any room for 'outsiders' and that their land and resources have been already usurped by them leaving them poorer. "The settlers from other side of the border are not the only problem. The Bodos have problems with other Indian tribals as well who have encroached on our land," says UG Brahma, a former MP and a recipient of the prestigious Sahitya Akademi award. "We have been appealing to the BJP to not divide the people by doing such things as giving rights to one religious group who have also entered illegally," says Bodo. He says all illegal migrants have to be dealt treated the same. Bengali speaking Muslims, too, are intrigued as to why the Centre is making such a distinction. They form the core support base of Badruddin Ajmal's AIUDF. BJP's attempts to polarise the elections may not work if one looks at these voices of dissent on its decisions from important quarters. Dhrubajyoti Bora, a noted novelist and head of the Asom Sahitya Sabha, an important outfit of the native Ahomiyas says that the issue has reverberated in protests in the Brahmaputra valley. Asom Sahitya Sabha and the All Assam Students Union, the Asom Gana Parishad - the party of the middle class native population - and some other outfits have also been lodging their protest against this move. "This decision is against the spirit of the Assam Accord," says Akhil Gogoi, an activist turned politician who has been campaigning against the BJP. He explains how the BJP has lost ground because of its anti-Assam policies since it came to power. "They have reduced the ration for the tea garden workers, scrapped the Northeast Industrial Policy, withdrawn the special category status and have now started supporting the big dams which they were opposing before coming to power." Meanwhile, Bora points out that in the Barak Valley, where a lot of residents have relatives on the other side of the border, it has not become a big issue. Barak Valley is also where bulk of this migration is directed at. However, he fears that in the Brahmaputra valley it could become a big issue as the elections approach closer. "One has to agree that the migration of Hindus from neighbouring Bangladesh is much more than that of Muslims in recent years," he points out while adding that this is happening because the benefits of economic progress haven't trickled down to the minorities forcing them to migrate. Bora points outs how there is a fear among the indigenous people that if this policy of allowing the people to come in continues then the migration will not stop and that the migrant population will become a threat for the locals. These organisations have also been demanding that if at all these migrants or refugees as they are referred to by some, have to be allowed, then there has to be a clear policy. "There is no clear mechanism as of now," Bora points out. He says that the Sabha and others have been demanding that these migrants should not be allowed to enter the voting rolls or to become a part of the ongoing National Register of Citizenship exercise. "It is not that we are against the humanitarian action of granting refuge to persecuted people as such. But there has to be a proper mechanism," Bora clarifies. Meanwhile, the BJP on its part has tried to assuage the fears of these groups by telling them through different channels that they are being just given refuge and not citizenship rights. "A senior BJP leader reached out to these groups and tried to explain that citizenship is a complicated process and takes years," a source points out. However, they are not convinced and want the BJP to clarify its position. "We will not support them if they back of from their promises," Bodo says. 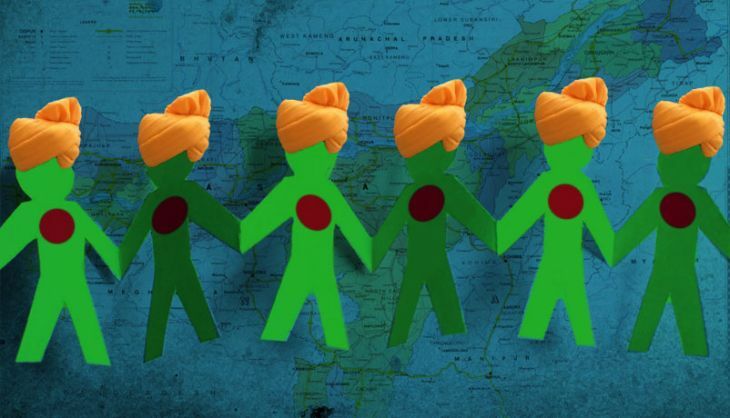 TWEET THIS If BJP grants citizenship to Bangladeshi Hindus, Ahoms & Bodos fear a demographic change in Assam Tensions have emerged in BJP's alliance with Bodo outfits. Can they hold together until Assam polls?